You are here: Home / Helpful Articles / Does My Event Really Need Lighting? I am sure you are asking yourself just that question, does my event really need lighting? With the economy being as terrible as it is most people are looking for ways to save money everywhere. You are most likely thinking to yourself that cutting out the lighting is an easy way to save some money. Most people feel that lighting isn’t a crucial part of the event decorations. This thought is wrong because lighting can definitely make or break your event. Most people also don’t know what type of lighting designs to choose. It is our intent with this article to inform you of your lighting options so that you can make better decisions when planning your event. When entering a room with lighting your guests involuntary feel whatever emotion you are trying to project. Lighting has the ability to create moods depending on its placement and coloring. It is up to you and your lighting design consultant to determine exactly what type of mood you would like your guests to feel at various times throughout your event. Wall lighting is a simple way of creating this mood. An elegant feel can be achieved by having your wall washes in amber tones. Using purple or blue wall washes give a more relaxed type of mood. Various other vibes can be created by using varying lighting colors. Wall lighting has the distinctive ability to draw the eye. Lighting is used in differing locale to get the audiences attention. In school, a teacher flicks the lights to get her students to stop talking and look to her for instruction. The lights are dimmed during presentations to make sure the speaker has the audience undivided attention. Lighting can be used to make all your other decorations look amazing by drawing your guest’s eyes to them. 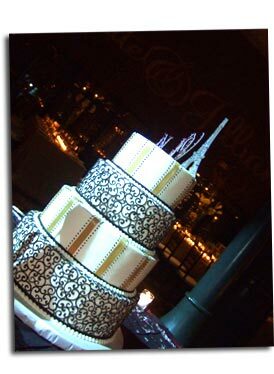 For example, your wedding cake can have a pin spotting or a monogrammed spotlight shining projected behind it. Your centerpieces can also have a pin spotlight shined on them so your guests can still notice the details while the room lighting is dimmed. The head table or the bride and groom’s table can also benefit from having a monogrammed spotlight illuminating it. Your floral arrangements also benefit from having lighting illuminating them from below. Dance floor lighting is a widely used form of lighting. Your guest can get a sort of club feeling with the dance floor lighting. Also, ceiling washes can be used to shine various things on the ceiling, such as stars. The lights can change colors and/or change pattern with the tempo of the music. A monogrammed spotlight is also widely used for the dance floor. You and your spouses initials can be shined upon the dance floor. This is especially a nice feature during your first dance. There are times when lighting needs to be added for function. Outdoor events really benefit from additional lighting especially in the evening. White work lights can look tacky, instead use a wash lighting in make the area appear warm. Foliage can be accented with up lighting and help your guest find their way in the dark. Photographer and videographers appreciate additional lighting because it helps them to get great shots. I totally agree with your article. I think that it is very important to have good lighting for an event such as a wedding reception. It definitely makes the mood. Having a custom stage spotlight would make the event very special and memorable. Thanks! Thanks for the comment Tracey, spotlighting works wonders in a variety of applications.